A new poll from Insights West suggests 66 per cent of Canadians would support laws forbidding distracted walking while using a cellphone. 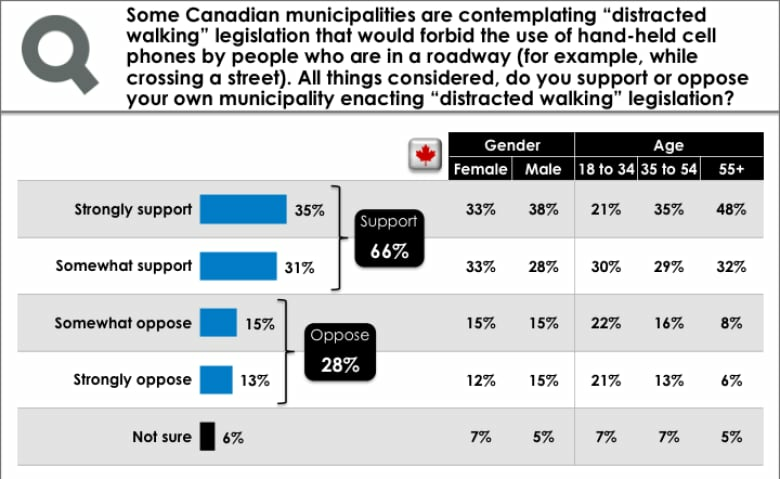 A new poll suggests the majority of Canadians are in support of regulations to ban distracted walking. Market research company Insights West asked 1,013 people across the country if they would support or oppose legislation that would forbid the use of hand-held cellphones while walking in roadways such as intersections. It found 35 per cent of people older than the age of 18 would strongly support a ban. Another 31 per cent say they would somewhat support the idea. Together, 66 per cent of people surveyed — or two-thirds — were in support of such legislation. The survey was broken down by age and gender, and that's where things get interesting, says Mario Canseco, the vice-president of public affairs for Insights West. He says both men and women across the country favoured regulation in similar numbers, but there were pronounced differences across the three age categories. Older adults showed the strongest support for the ban. "Baby boomers who probably haven't been texting that much … who look at this as a distraction, who look at this as something that could cause insurance problems down the road," says Canseco. More unexpected was agreement by the majority of younger people between the ages of 18 to 34 at 51 per cent, he says. "It's a little more of a close split than what we see with generation X or boomers, but even them, who grew up texting … are actually aware of the dangers they could be walking into without this type of legislation." However, he notes that the majority of those who fall into the category of "strongly oppose" are millennials. With such strong support across the board, Canseco says, municipal governments should seriously consider the survey's outcome. "It took us a couple of decades to figure out the dangers of driving while you held a cellphone in your hand," he said. "Maybe this is a good starting point to try to figure out whether we have mandatory regulation that makes you stop texting or using your phone before you cross the street." Some cities across the country have already indicated interest or have tried to put a ban in place. In July, Toronto's city council passed a motion asking Ontario's transportation minister for a ban, but were later told that the city has the power to pass its own municipal bylaw. Following Toronto's move, a Vancouver city councillor publicly voiced his support for a similar ban. In December 2014, a councillor in Calgary asked the city and police to look into fines for distracted walkers. However, a province-wide ban is unlikelyin British Columbia: the Ministry of Public Safety and Solicitor General says local governments have the authority to regulate pedestrian traffic if they want to. For comparison purposes only, a probability sample of this size would yield a margin of error of plus or minus 3.1 percentage points.